ball display. A generous and kind man, Ev Cochrane died, after a short bout with leukemia, on August 10, 2004. It could be noted, both Ron Otto and Jurine Borton, from the class of 1956, named their first children with Cochranes in mind. Ron's son's middle name is Everett and Jurine's daughter, Mashall Rana, born in 1962, after the Cochranes had their daughter Michelle. This was following Ev's back to back state championships at Marshalltown. Jurine Borton set school scoring records from 1952- '56. She played basketball as an eighth grader and had a 33 point performance for Coach Gerald Petersen. For St Anthony, her Dad, Roy, as a senior, had also scored 33 points in the same New Liberty gym used in 1929. In the summer of 1952 she experienced a bout with polio between 8th and 9th grades. It became a personal, physical challenge to be active and accurate again. It didn't come easy, and she reports her freshman season under Coach Barney Beasmore was nearly hopeless. She averaged 4 PPG and usually played in the guard court. Then, as a sophomore, in Ev Cochrane's first year at Milford Twp, she averaged 18 points per game and her junior year she averaged 26 points with a 60% field goal mark. While scoring a 33 point average her senior year Jurine exhibited a variety of Coach Ev Cochrane's offensive moves and shots. See pages 110-111. She set a Story County scoring record of 57 points on the home court against United Community (a 1956 sweet sixteen state contender recognized for their strong defense). That record stood on the county record book until 1961. Her record of 22 consecutive free throws was set in a game at Gilbert the same winter of 1956. (Milford won; 76-48) See pages 103, 303. Jurine was the catcher for Milford's first softball team. In the fall of her senior year, Jurine's eight years of 4-H work with the Milford Merry Maids (she had also had an eight year record book for the Milford Hustlers, which was considered a separate entity) was recognized as the best 4-H Record Book in Iowa for 1955. 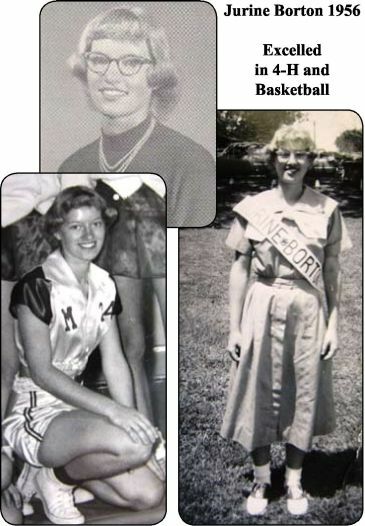 She planned to turn down her invitation to attend the National 4-H Club Congress in Nov 1955, because she didn't want to miss three ball games. Then, Supt Hopkins and Coach Cochrane not only intervened, telling her she needed to `get off the farm', and if she stayed home she would sit on the bench, then she was given a Samsonite suitcase at a special HS Assembly. While at the week-long event Jurine was one of seven Iowa National 4-H Scholarship recipients. She later formally requested to have her award transferred and was the first in the nation to use a National 4-H Scholarship at a college other than a land grant University. In 1994 when her Irrevocable gift was announced by the Iowa 4-H Foundation, she also initiated the first annual `4-H Day' at ISU Football games. From 1994-2000, Jurine served on the Iowa 4-H Foundation Board of Trustees for the maximum of 6 years. Coach Ev Cochrane encouraged her to go to Iowa Wesleyan College and literally took her there and helped her enroll. Her college basketball career of playing with Iowa's best- including Sandy Fiete, Garnavillo; Glenda Nicholson, Maynard and Gilbert's Clea Reinsch- resulted in being a part of IWC's best ever women's' team that finished Runner-Up in the National AAU Tournament. (IWC was the only Iowa college to offer women's sports at that time despite Iowa having the most extensive high school girls athletic program in the nation.) But disappointedly her college cage career ended with a 10-day stay in the Henry Co Hospital to dissolve a `grand' blood clot in her leg after a collision on the court during an IWC practice. She later was able to participate in some college intramural intercollegiate athletics; basketball, volleyball and field hockey for Iowa Wesleyan, usually against Parsons. In her teaching career, Jurine used her double majors in Home Economics and Physical Education. She initiated the girls athletic program at both Keystone and Marion where she taught and coached; basketball, softball, gymnastics, track and/or volleyball. Including her experience at Springville she coached for 18 years. She served on the Iowa Girls High School Athletic Union Advisory Board for Track or Girls and Women's Sports 1968-'86. See page 206.